Period View can be configured using Admin Options > Working Days. Period view of time entry also supports both two types of format (standard and with start time and end time). You can customize this option using Admin option > Preferences (Show Clock Start/End) Option. A client selection drop-down can also be enabled in Time Entry using Admin Options > Preferences > Show Client In Timesheet check. By default, TimeLive always give one blank rows in week view to enter new timesheet record. Click Edit Icon on the left. Select Client Name. Project Name from the popup option and the Task. Then click green button Update. Then fill the hours(if Start Time/End time option is enabled) fill the end time as well). Then fill the description of your work. Then Click Save after you are done for now. Your activity on this sheet will only be saved and will not be forwarded for approval. Click on Submit Button to sent it for the Approval process. You can continue on adding a new row in time entry record from next row. If you want to add more row, save it first and then TimeLive system will give additional 1 row for entering more records. Navigate to Total Time field either using a mouse or a keyboard. Remove information in Total Time field which is already entered. Click on Save button to remove the saved time entry record. Click on the Delete icon next to Edit icon on left. Click Ok on the popup for confirmation. Navigate to Time Entry row which you want to change. Click on the Edit Icon next to Delete button. Select different Client, Project or Task. Click on Update button to save this change. Click on Submit button to submit time entries for approvals. After submit, all time entries will be locked for users. After submit, time entry status show Submitted and also reflects on Approval Status at the bottom of the Period View page. In Timesheet Period View, below the Save and Submit button, there are very useful options through which a lot of time can be saved. 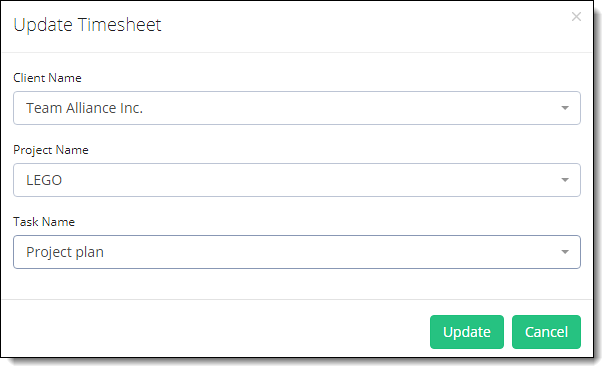 Copy Timesheet: While on any Timesheet period, the user can copy any existing Timesheet period by using Copy from Date. Through this option, all entries including, Projects, Tasks, hours, their descriptions will be copied from given period date to current period. Copy Activities: This option will copy only Project, Tasks to current Timesheet period. Hours will not be copied. Export Offline Timesheet: This option will save a CSV file of the current Timesheet period on your computer. Import Offline Timesheet: This option will upload saved CSV Timesheet file from the computer.